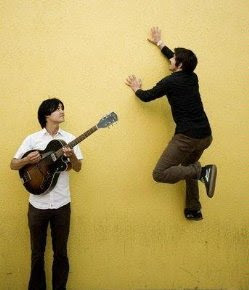 It was past noon on the west coast when I called the number provided for the interview with Meric Long of The Dodos. He sounded sleepy indeed and I wasn't sure how things would go from there, but once he was on topic of discovering a musical path the conversation flowed nicely. With a name that could serve a novel well, I figured he had lots to say. What I didn't expect is that he's a "super shy" singer and they didn't have a third touring member lined up for gigs the following week! Meric was relaxed even while talking about the distinctive percussive sound of his band -- whether strumming guitars or bowing a vibraphone. I heard about them from my son who was very jealous I was able to go see them warm up for The New Pornographers last June, although I did bring home a T-shirt. I also recognized/enjoyed their song "Fools" on a Miller Chill ad two years ago. My interview for PopMatters is found here.